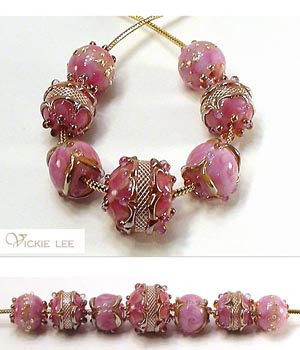 Vickie Lee has begun selling beads on her website, www.vickielee.com and I was her first customer. When I saw this set of Pink Mesh, I was in awe. I've been very good about using up the beads in my inventory to curtail my spending, but these just had to be mine. I've admired another artist's similar style, but never found the right color there. They were usually too deep and dark....so, as I waited, I looked around, and here were these beads in the most perfect color (insert happy dance). Vic was so thrilled, she even sent a surprise focal bead to match. I'm keeping this set for myself, but I bet she would make it again just for you. Sunshine is visible today, so there's a whole new light on the world after all our rain. I was just telling a friend that, as a California girl, I fully appreciate the CHOICE to go TO the snow instead of being caught in it whether you like it or not...it's just not the same with rain! I'm waiting for the air to warm up a little so I can take a walk before the wind kicks up. I'm blessed with the access to a little bit of country just up the street where I can walk without hearing traffic and can spy Snowy Egrets, red tail hawks, a multitude of ducks, Canada Geese and, for the first time in my life....swimming squirrels! I didn't know they swam. My husband said, hey, they're basically a rat with fur...of COURSE they can swim! I look forward to showing you the bracelet I'm finishing up today with the Krissybeads from the previous post.